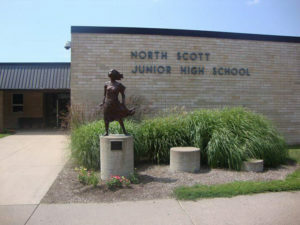 Administrators of an eastern Iowa school district are considering new safety measures after a recent shooting attempt. Police say a 12-year-old student at North Scott Junior High in Eldridge pulled a gun on a teacher and tried to fire but the safety was on, disabling the gun. Superintendent Joe Stutting says he’s rethinking the district’s security policies since the incident August 31st. “And at the same time, you don’t want to make those kind of decisions in the emotions of a situation,” Stutting says. “You want to take the time to research it out, whether that’s changing a policy or adding personnel or what it might be. We’ll analyze that out and everything’s on the table.” Community members have suggested installing metal detectors or hiring more security guards, but Stutting says resources are limited. “Iowa doesn’t fund education to support hiring security guards, whether they’re SRO officers connected to a police force or a private one,” he says. “There’s no ongoing source for that and I think that’s something our legislators will look at when we get into the next session, I’m sure.” Stutting says declining enrollment in the district is also limiting resources. The student, whose name wasn’t released, is charged with attempted murder.